Nelson Mandela was born 90 years ago. Over the course of his lifetime Mandela was a lawyer, freedom fighter, leader of the African National Congress, and finally, president. In honor of his birthday, July 18th, we look back at his 1963 treason trial where he outlined his dream of democracy in South Africa and declared, “It’s an ideal for which I am prepared to die.” It was the moment when Mandela became known to the world as a symbol of resistance and democracy. 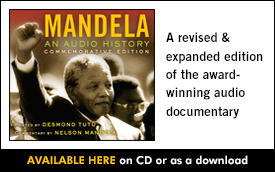 Get the full story of Mandela's struggle against apartheid here.